Kubra's City Diary: Get London reading? Whaa?!? Few weeks ago, The Evening Standard -London's free-to-pick-up paper launched a courageous campaign to tackle illiteracy in the capital. I was impressed by the jaw-dropping figures given by the paper. Get this: Thousands of 11-year-olds start secondary school in London with a reading age of seven! And Education Secretary Michael Gove said: "Children who cannot read are condemned to spend their entire life in a prison house of ignorance." I am not planing to praise the paper because of the charity they organized to get London kids reading by the help of volunteers. Not because they don't deserve but I shall draw a different picture with these colours. London as the capital city of United Kingdom is the centre of civilization in the eyes of people in the Eastern world. 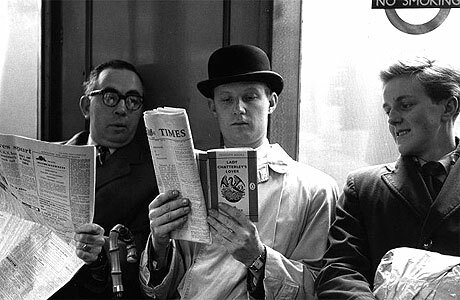 Trains and undergrounds in early mornings are full of people whose only foreheads could be seen, half of their faces are covered by newspapers, Ipads, books, magazines, papers whatever you can read something from! Especially when it comes to education, university degrees in engineering, science, law, literature, art and lately media UK universities are still far more better than the ones in Europe and the US in terms of their educational values and quality. 35 years ago when my father studied textile engineering in Bradford there wasn't even any better course in elsewhere in the world to compete with the textile-knitting technology education in the UK. Years later UK universities still hold their good reputation at least in the Eastern world - hard to get acceptance for masters degrees, strict rules during the studies and intensive academic programmes. So what on earth happened to the UK and its capital suffers from children illiteracy? The paper reports that illiteracy mostly is the problem of the kids whose families speak English as a second language. We know that almost 80% of London is populated by foreigners. But wait a minute. English is my second language as well. I spent -including cost of living £16k for one year masters degree and another £8k to improve my English to academic level. Excuse me sirs! but if those families are refugees and holding UK passports they shouldn't have the luxury of not speaking English and not teaching or reading their kids in English. Minority or refugee no excuse is acceptable for not reading in the official language of the country you live in. This is like Turks who live in closed Turkish community in Germany and can't read German or Kurds in the Eastern Turkey who can't read in Turkish.